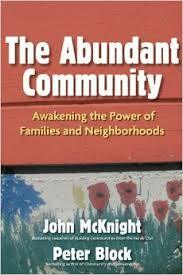 The Abundant Community: Awakening the Power of Families and Neighborhoods by John McKnight and Peter Block, Berrett-Koehler Publishers, San Francisco, 2010, 173 pp. I have been feeling a great sense of discontent in recent years about the engagement of churches in traditional mission endeavors. My own congregation houses a thriving community meal, which has served 75-100 people every Saturday for more than 20 years. It’s important to those who come for food, and even more important to those in our congregation and many others who find a venue there for Christian service. However, I wonder exactly what we are doing. Are we actually ending hunger in our community, or are we making it easier for the community to allow poverty to persist? Are we enabling forces of poor wages, corporate greed and negligent government to stand unchecked by softening the consequences of their action? Feeding people who are hungry feels like a basic good, something that ought to be clean and true and good. But are we ending hunger, or just perpetuating it? Especially because it makes us feel so good to be a part of it? This book is the first of a series I am reading to help address this topic. I have a background in congregation-based community organizing, and read Toxic Charity by Robert Lupton last year to begin to address these issues. This book, along with several upcoming, will continue that conversation. 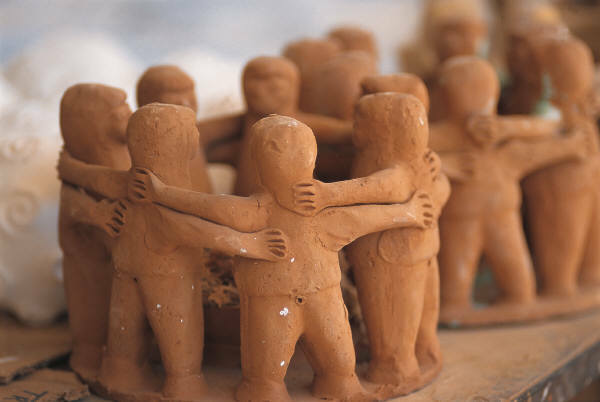 The Abundant Community draws a sharp contrast between consumerism and citizenship, and the kinds of community that are possible within each conception of human life and connection. In the introductory chapter, beautifully titled “Welcome,” McKnight and Block draw the distinction. We have replaced the functions of family and neighborhood–caring for children and vulnerable people, providing security and income, sustaining health–with marketable goods, which has diminished the meaning of family and neighborhood while leaving us ultimately dissatisfied by the market’s inability to adequately provide what we seek (and have always found) in community. The first two chapters outline in detail the difference between consumerist attempts to provide those goods and community ones, and the history of how we moved from one to the other in the last century. The market mentality builds impersonal systems, with predictable ways to meet stated needs. However, those systems are predicated on perpetual need, commodified responses and predictable outcomes—none of which are capable of giving us the true intimacy, community and care we desire. The market relies on this ongoing dissatisfaction to ensure our continued engagement as consumers. Systems are designed to produce cures, but the human condition is not a problem to be solved. (38) McKnight and Block point to examples from education, law enforcement, grief care and health care to demonstrate how our consumer model of dealing with these concerns fails repeatedly, when a community approach could succeed. One interesting observation they make is around privacy, professionalization and its impact on community. Instead of dealing with problems together as a community, they argue, we send away everyone with a problem to a professional, which diminishes the community’s capacity to deal with problems. The third chapter enumerates the true costs of living in a consumer world–to the environment, to our sense of self worth, to relationships in the family and neighborhood, to the possibility of satisfaction. Because we have ceded so many responsibilities to the marketplace, neighborhoods, families and communities have become incompetent to deal with them. 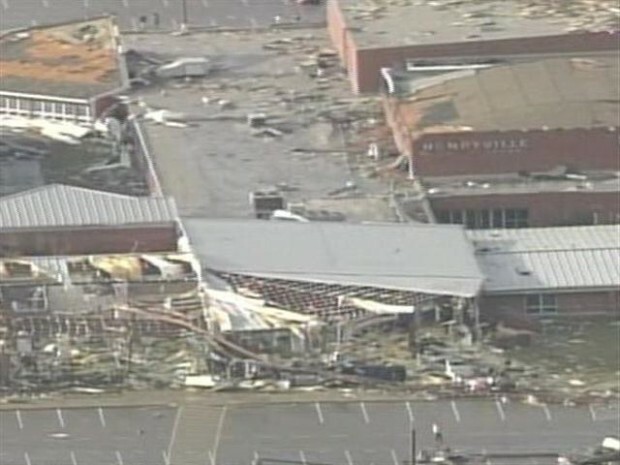 We must rebuild capable communities in order to reclaim those responsibilities. One interesting observation throughout the book is the way that the consumer way strangles personality and individuality. The authors write, “A community is a place where you can be yourself. 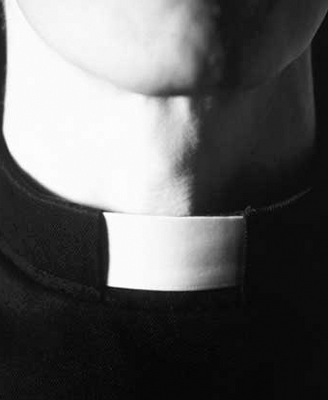 The institution causes me to lose myself–to be replaceable or to be called a ‘case. '” (55) I wonder at churches in this assessment. One of the best, most beautiful things about some churches is the way quirky people can find a way to serve and love and care for one another in true community. Yet sometimes, we in those quirky churches full of quirky people wish we could be more like the big, institutional, well-resourced churches who didn’t have to mess around with such troublesome uniqueness. Perhaps that instead is our greatest gift. The authors instead suggest that valuing idiosyncracy is key to community. The people in communities are not replicable–it’s Dr. Jack, the church usher that always carries Lifesavers in his pocket for the kids; it’s Horace’s unique artistry that graces the sanctuary; it’s Norma’s special brand of prayer and friendship. These things are unique and cannot persist beyond their lifetime, and that’s what makes the community. The second half of the book points toward strategies for reclaiming community over consumerism and rebuilding competent communities. McKnight and Block name the abundance already present in communities–the collection of gifts, skills and competencies shared by any group of people. We must organize to help people share their unique gifts, rather than depend on impersonal systems. The way out of incompetent communities and consumerism is to claim our abundance, celebrate unique gifts, and decide to be satisfied with what we have. There is much wisdom for pastors and churches in this book, and much to consider on my original question about church mission projects. Does our community meal foster community? Does it identify gifts and abundance? How can we do better? 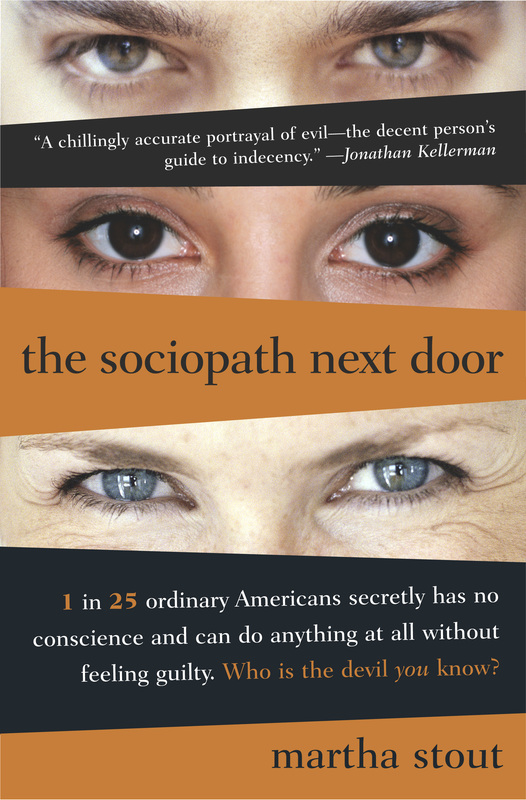 The Sociopath Next Door: The Ruthless Versus the Rest of Us by Martha Stout, Three Rivers Press, 2005, 241 pp. Clinical psychologist Martha Stout has spent much of her career helping people whose lives have been damaged by the work of sociopaths. Sociopaths, she argues, are not just the stereotypical violent criminals without a conscience. In fact, she argues, one in 25 ordinary Americans lives without a conscience. This book is a conversation not only about how to recognize (and avoid falling prey to) the sociopaths in your life, but about the importance of conscience to our understanding of what it means to be human. Drawing on case studies from her own practice, psychological research, and philosophical understandings, she explores the role of conscience in our social work, and the dangers of its absence. The opening section of the book describes conscience as a seventh sense, an human capacity for care and concern for the needs and feelings of others. Stout describes Joe, a man who left for a very important meeting and work trip without leaving enough food for his dog. Does he turn around and go back, or leave the dog hungry until morning? What force, internal or external, drives his decision? What makes him return to feed the dog is the thing we call “conscience,” and Stout traces the development of the idea from early Christian thinkers like Jerome and Augustine, to Aquinas, and then on into the modern conception of selfhood developed by Freud, carefully distinguishing between conscience and super-ego. To be a sociopath is to exist without this thing called conscience, this nagging accountability for the feelings and well-being of others. 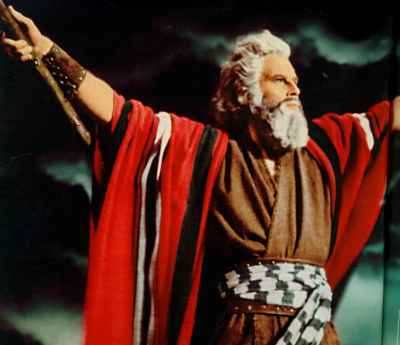 Contrary to our stereotypes, many sociopaths are popular, well-liked and successful in life. She tells the story of Skip, a wealthy, married businessman who gets ahead by ruthless cunning and winning the affections of others; of Doreen, who passes as a licensed psychologist and treats patients, all while manipulating coworkers simply because she is jealous of them; of Luke, who married a woman for her pool and continued to evoke pity even in those of whom he had taken advantage. To a sociopath, life is a game for the winning, and those who bother to care about others are chumps and losers. Stout details the ways that sociopaths learn to use the consciences of those around them as tools of manipulation. The key way to identify a sociopath, she says, is pity. Sociopaths evoke pity in those around them, because people are most easily manipulated into generosity, sacrifice and obedience when they feel sorry for someone. (107-108) Ironically, what is most pitiable about sociopaths is the same thing that makes them the most dangerous. Sociopathy is rooted in the complete inability to form an emotional attachment to another human being (or animal). Stout writes, “Conscience never exists without the ability to love, and sociopathy is ultimately based in lovelessness.” Sociopaths are so dangerous to human relationships because they have absolutely no care or concern about the well-being of others. One interesting observation Stout makes is about the prevalence of sociopaths in American culture, compared with other parts of the world. In the Western world, sociopaths make up four percent of the population, as compared with 0.03-0.14 percent in East Asian countries like China and Japan. (136). Psychologists believe that sociopathy is caused by a combination of both nature and nurture, as life experiences can trigger certain genetic predispositions. Perhaps, Stout argues, cultural norms of group identity and familial obligations can curb sociopathy in those cultures. In America and the West, by contrast, our cultural values of acquisitiveness, power, individuality, independence and freedom can actually encourage and reward sociopathic behaviors. The book concludes by looking at the opposite of conscience-less sociopathology–those individuals with an overabundance of conscience. By contrast, Stout reminds us that these people are not troubled souls. In fact, they are our moral heroes. If conscience is linked to the ability to love, an abundance of conscience comes from an abundance of capacity for love. These moral exemplars are those whose hearts are big enough to love beyond the normal scope of friends and family, and to take responsibility for social justice in the wider world. If the absence of conscience is a grave danger, its excess is a gift to all humanity. Stout’s book is an interesting read. As someone who works with people from all walks of life, it was informative and insightful about how to be on the lookout for those who are dangerous to communities and individuals within them. Looking over my congregation, community and circles of relationships, I did not recognize sociopaths in our midst after reading this book, certainly not at a rate of 1 out of 25. However, I think this information will arm me well if and when someone raises my suspicions, and help me think through how to protect those most vulnerable.